Lunch by the pool. Pretty nice! 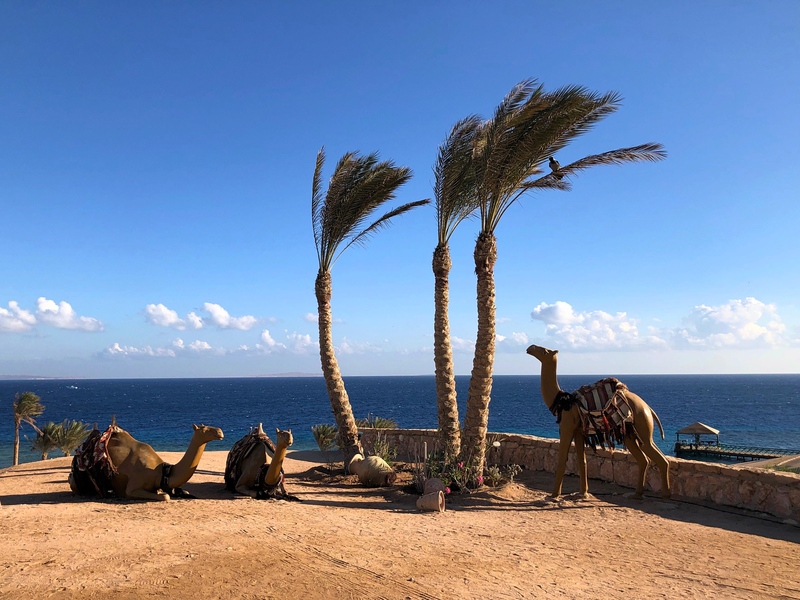 Our last stop in Egypt was Sharm El Sheikh, a tourist hub at the southern tip of the Sinai Peninsula. 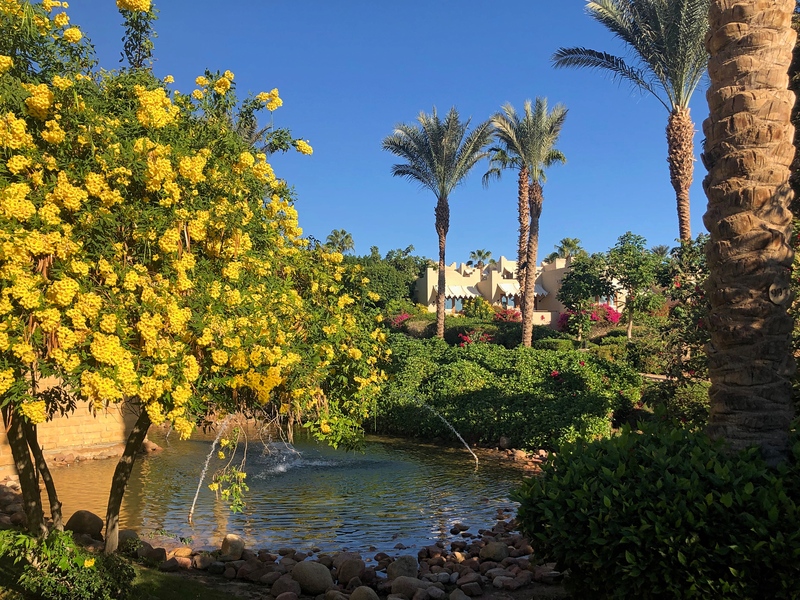 Technically in Asia, the city is a quick flight across the Red Sea from Hurgada and is sometimes known as the “City of Peace” in recognition of the many international peace conferences that have taken place here over the years. That name was a bit harder to maintain after Islamist terrorists set off a series of bombs, killing 88, in an attempt to damage the tourist industry and thus Egypt’s economy. To be sure, the attacks certainly did damage the economy though it didn’t have the longer-term impacts the perpetrators had presumably hoped for. In more recent years then-President Hosni Mubarak flew here during the Egyptian Revolution of 2011 and it was here that he resigned. Our experience was significantly more peaceful, this proving to be one of the more beautiful places we have been in some time. 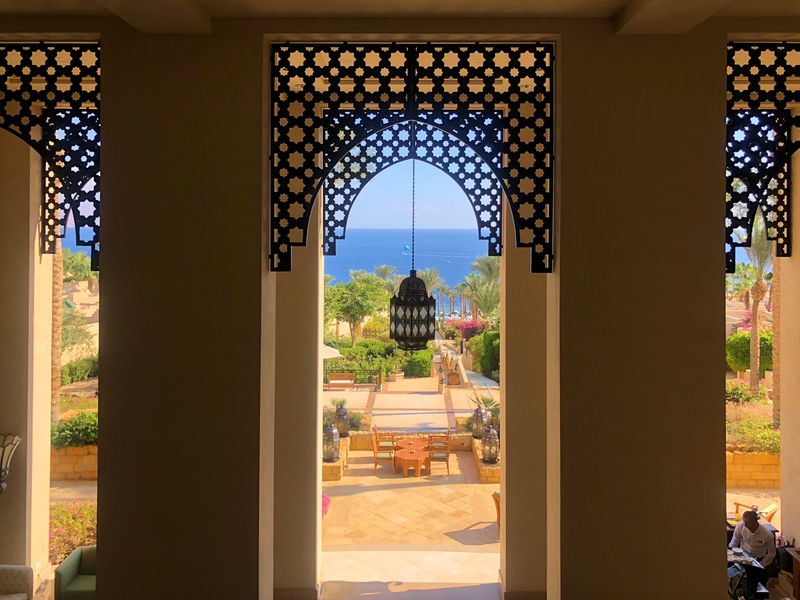 We kept looking around at the lush gardens and beautiful pools, lounging in our beautiful room wondering how in the world this could be only a small amount more expensive than the Oberoi over in Hurgada. 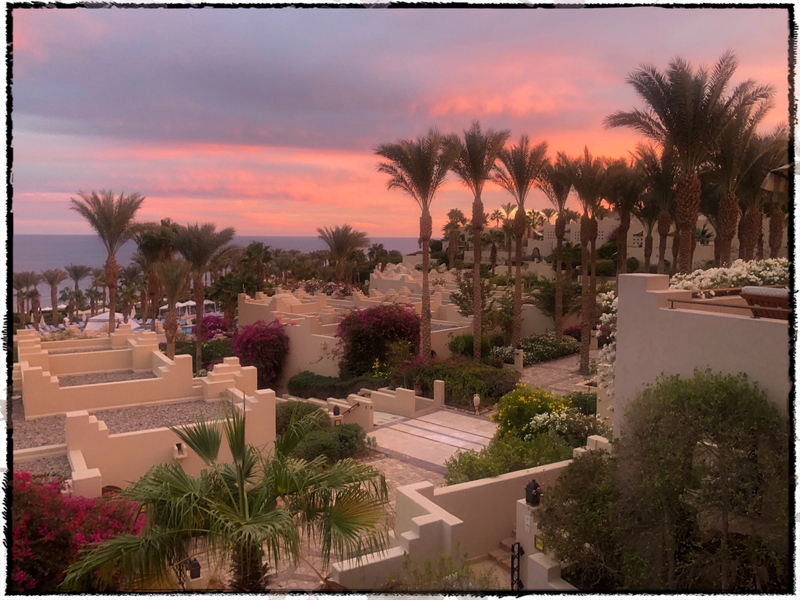 Take my word for it, if you need to choose between the two, come to Sharm! This guy seems to have a good life. And presumably never gets bad treatment from the hotel front desk. Oh my God. We ended up spending an hour sitting in the lobby, first explaining it to them, then arguing with them, and then finally getting Hotels.com on the line. The help desk there got it straightened out and finally the front desk gave us our key. When Mark explicitly asked for an apology – it was clearly and completely a mistake in their system – they declined to do so. A bad way to start, but it ended up well. Mark gets pissed about stupid behavior like this so he prepared to talk with the general manager the next day. He Googled the guy, saw his photo and then at breakfast when he saw the guy went right up told the story. To his credit the GM didn’t try to explain or justify or anything like that. He apologized and said he would fix things. 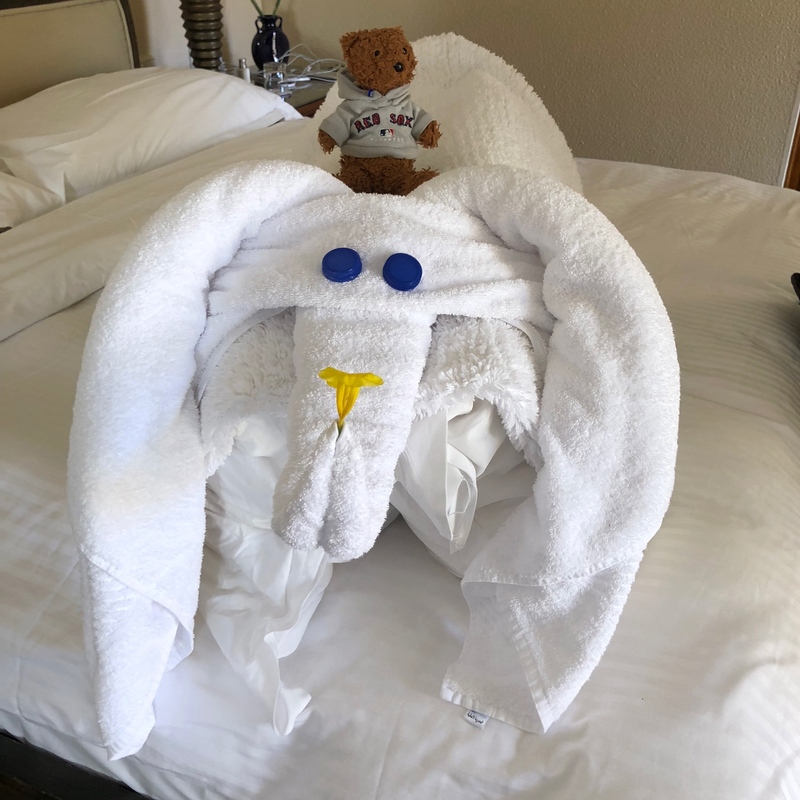 Ultimately he offered us an upgrade (we declined; we liked the room we were in better), comped our dinner that night (including wine; nice touch), and saw to it that for the next four days staff bent over backwards to make sure we had a nice stay. And we did. There wasn’t much to do besides just hang out at the beach but that’s always one of favorite things to do. 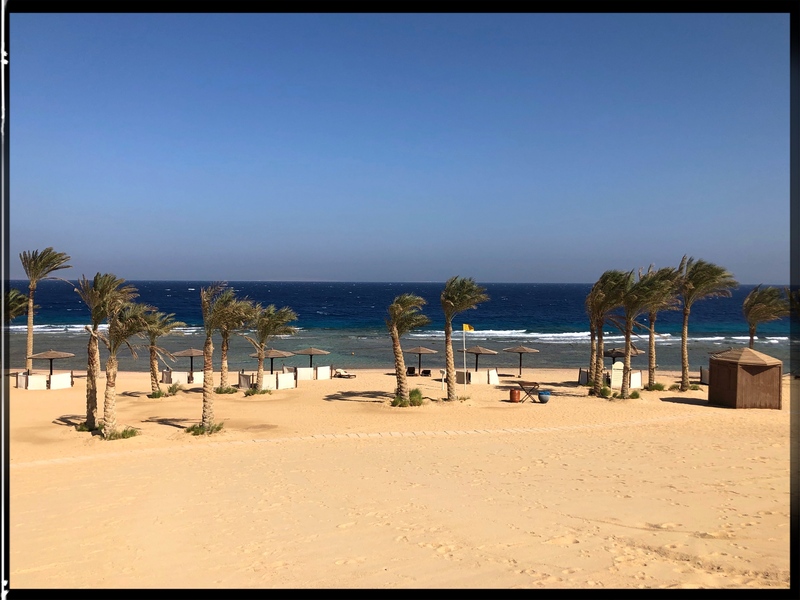 The one thing Hurgada had over Sharm El Sheikh was that the snorkeling there was better, but otherwise there was nothing not to like about hanging out, reading, swimming, eating, enjoying the lush grounds … you know, the usual. A nice way to finish our month-long stay in Egypt. Except it wasn’t quite over. We were to catch a flight to Cairo and then a connecting flight through Dubai to Brazil. And I think the airport at Sharm El Sheikh was probably the worst airport experience we’ve had ever, anywhere. The security lines were just insanely long, slow, and messy. It was crazy, at least 30 minutes, probably closer to 45, before you could get to the check-in counter, check your bags … and go through security again. It’s not as though security was tight, though. As we finally got right near the front where one guy was slowly checking IDs as people kind of massed around him, trying to get his attention so he would take their ID and let them through, I saw a Chinese woman just walk past while he was distracted and go to have her stuff x-rayed. So a terrible finish to go with our terrible arrival. In between, though, it was close to perfect. Now on to Brazil! 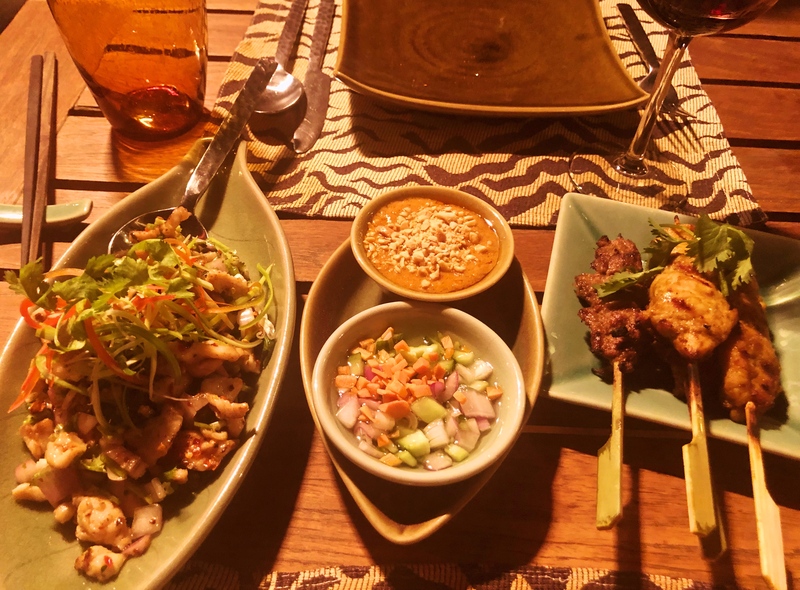 Big excursion – one night we left the hotel to go to a Thai restaurant in a Hyatt hotel. It was good but just a hassle to deal with taxis so otherwise we pretty much just stayed at our own hotel. 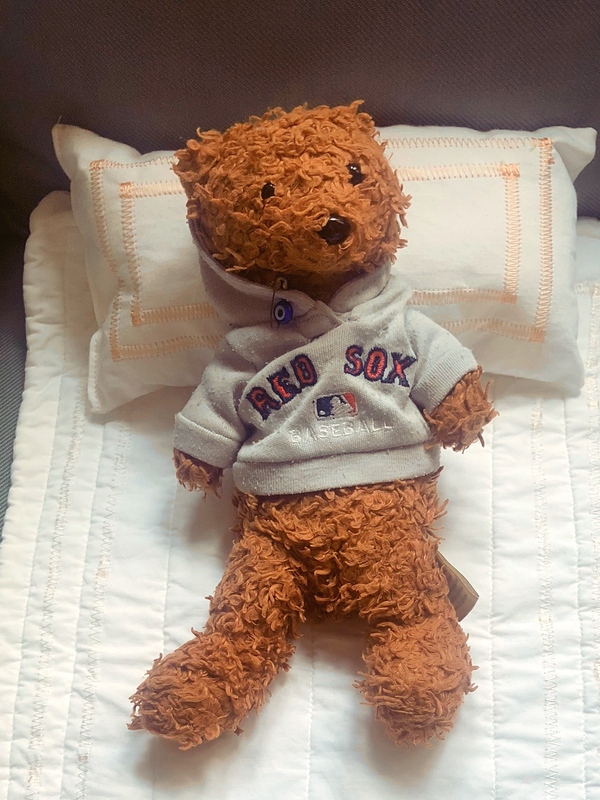 Boston Bear loved the place too. They set him up with a tiny pillow and little blanket that was just perfect for him. He’s bugging already to go back! We were pleasantly surprised when we saw some camels on the grounds of the hotel. Then even more surprised when we realized they were plastic. 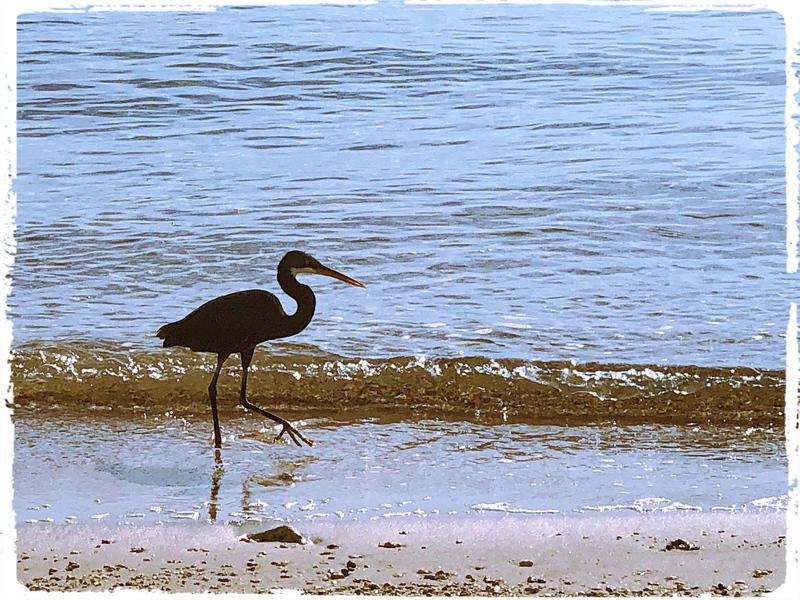 After three weeks traveling the length of the Nile, from Alexandria in the far north to Abu Simbel in the far south, it was time to ditch the history lessons and head to the beach. In Egypt “the beach” means the Red Sea. The Red Sea offers two primary playground areas. 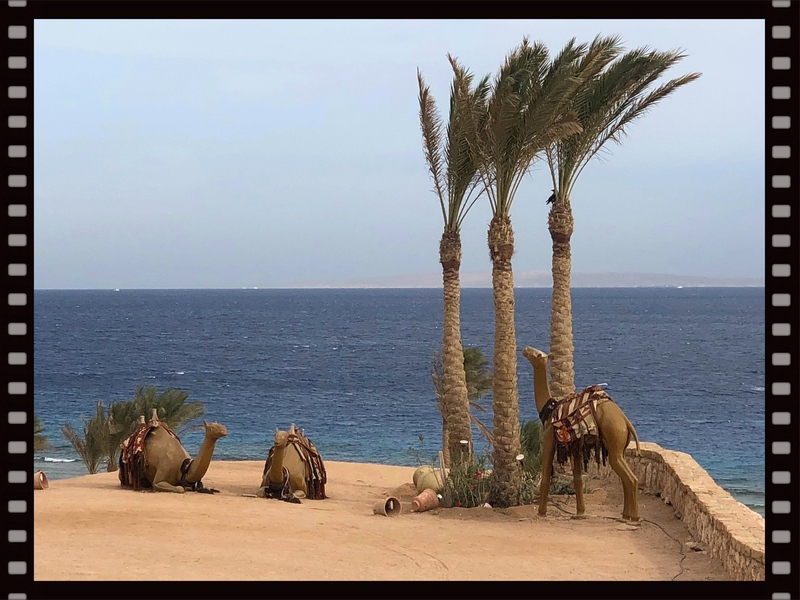 The first, Hurghada, runs along the edge of the Eastern Desert — the vast stretch of desert between the Nile and the Red Sea. The alternative is Sharm El-Sheikh at the southern tip of the Sinai peninsula. Both areas are famed for spectacular diving and snorkeling. Both areas are massively built out for tourism. 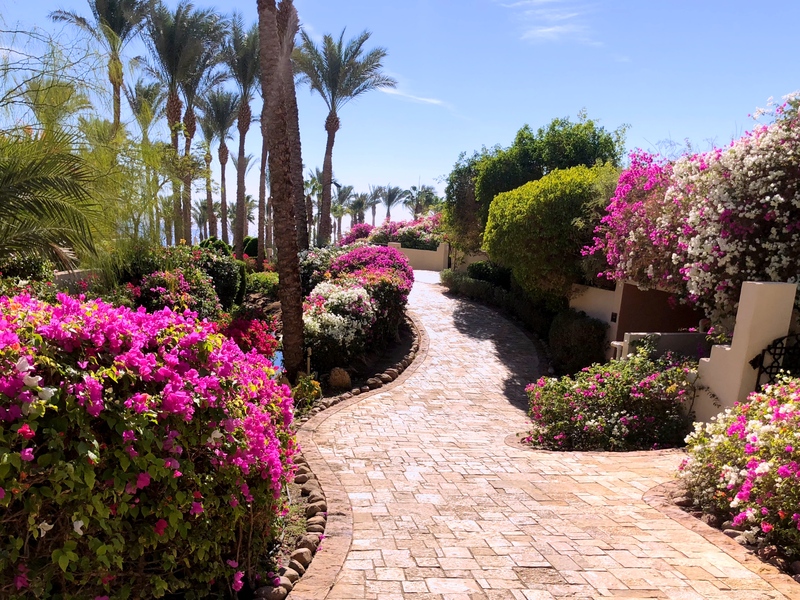 I was in Hurghada on my last trip to Egypt 34 years ago, so I was more interested in going to Sharm El-Sheikh this time. And besides, Hurghada sounded quite overbuilt and a bit run down, while Sharm El-Sheikh is reputed to be a bit more stylish and with more appealing places to stay. Nonetheless, the way the transportation worked out, it was pretty convenient for us to visit both, so we ended up booking five nights at each place. 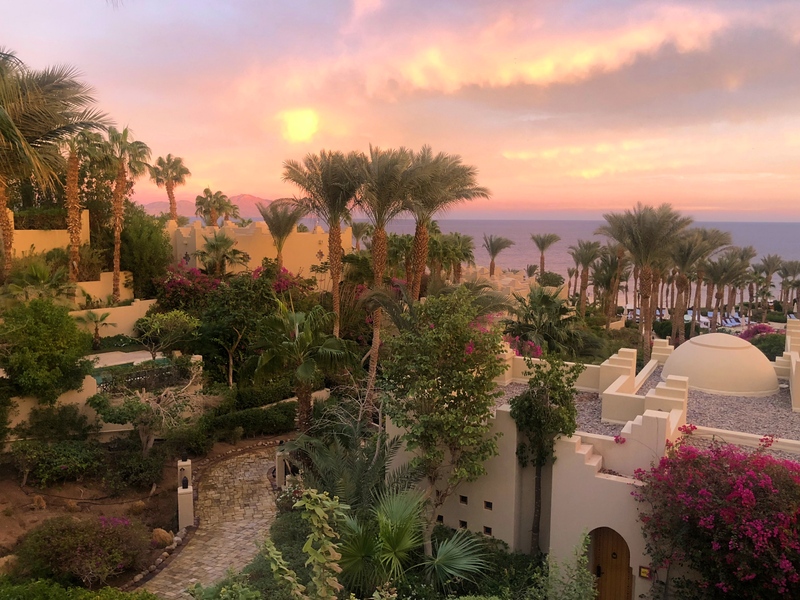 From Luxor, it’s a three-hour drive across the desert to Hurghada, and from there it’s a 30-minute airplane hop over the Red Sea to Sharm. Indeed, the contrast turned out to be stark (though we’ll save stylish Sharm El-Sheik for our next installment). 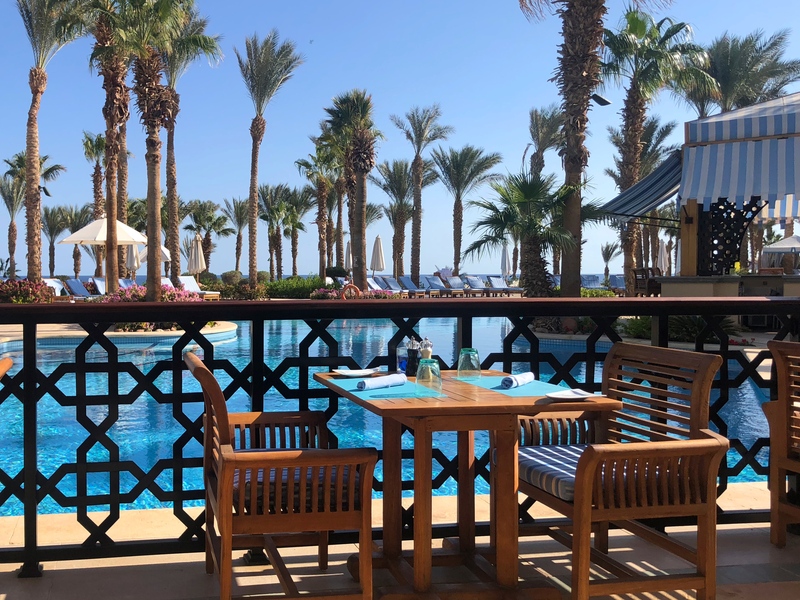 After five nights in Hurghada we are hard pressed to say very much nice about the place — except that the snorkeling was really impressive. From our hotel you could swim right out to a reef teeming with colorful fish and coral and the works. Regrettably, we have no underwater camera, so you only get pictures of the lesser beloved aspects of our stay. 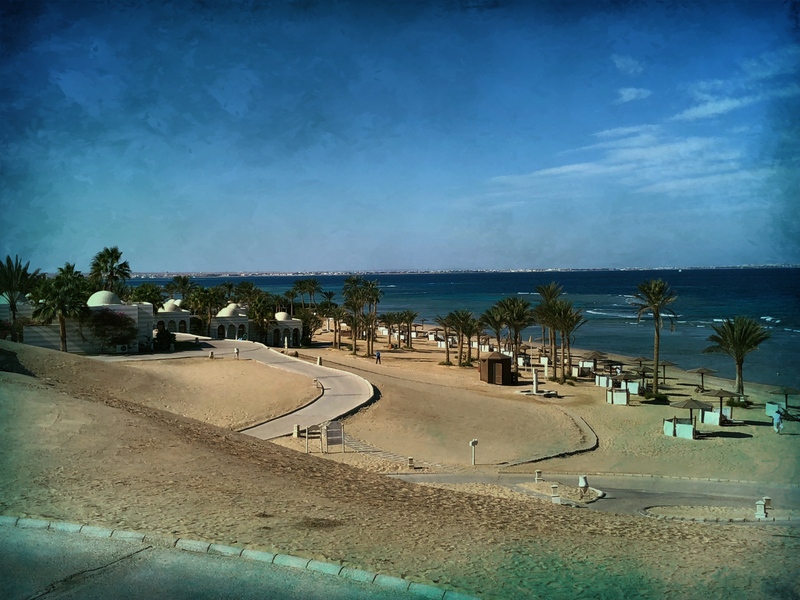 When I first considered (skeptically) staying in Hurghada, I was less than thrilled wth the choices of accommodation. The place is jam-packed with junky looking all-inclusive resorts catering to Europeans who jet into “Egypt” on cheap package holidays. And a lot of resorts here appear to be abandoned, victims of a tourism slump since the revolution of 2011. 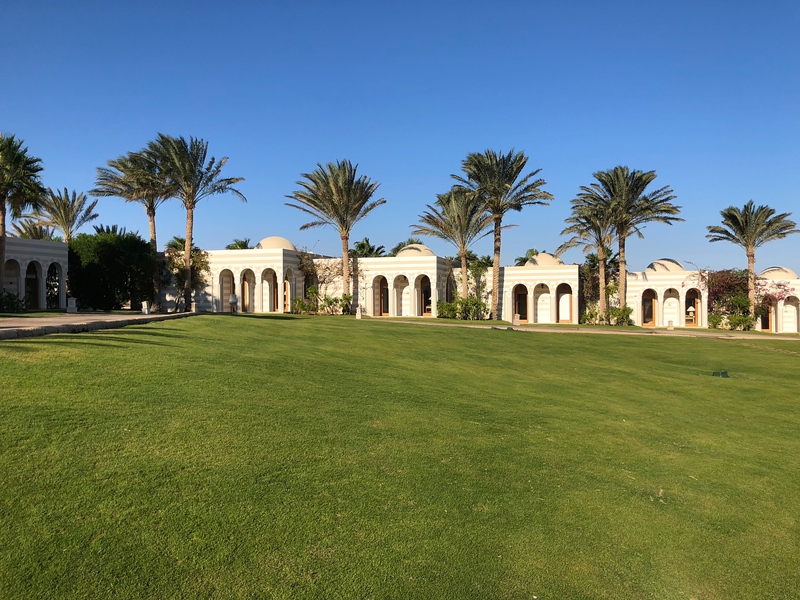 But then I discovered that the upscale Indian hotel company Oberoi has a property in an area called Sahl Hasheesh at the far Southern end of the sprawl. 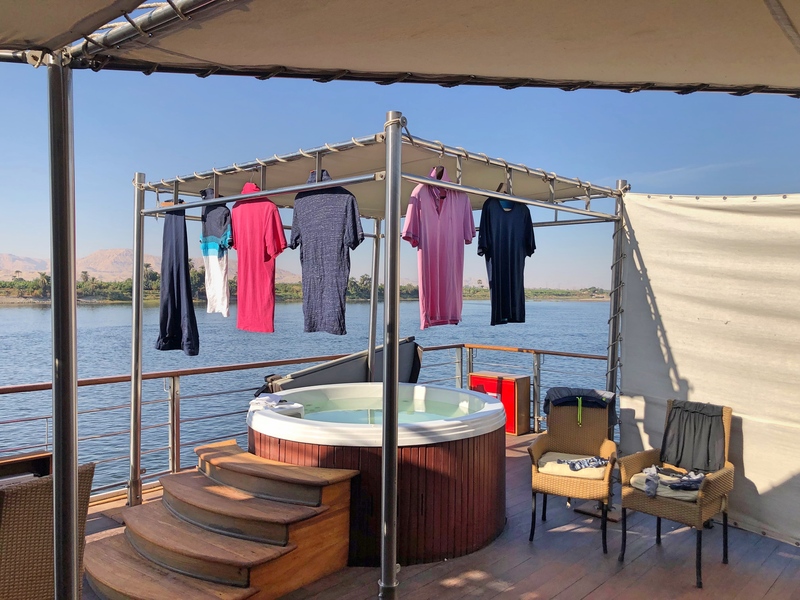 Since our Nile cruise was also run by Oberoi, they’d include a nice comfy transfer across the desert for us. 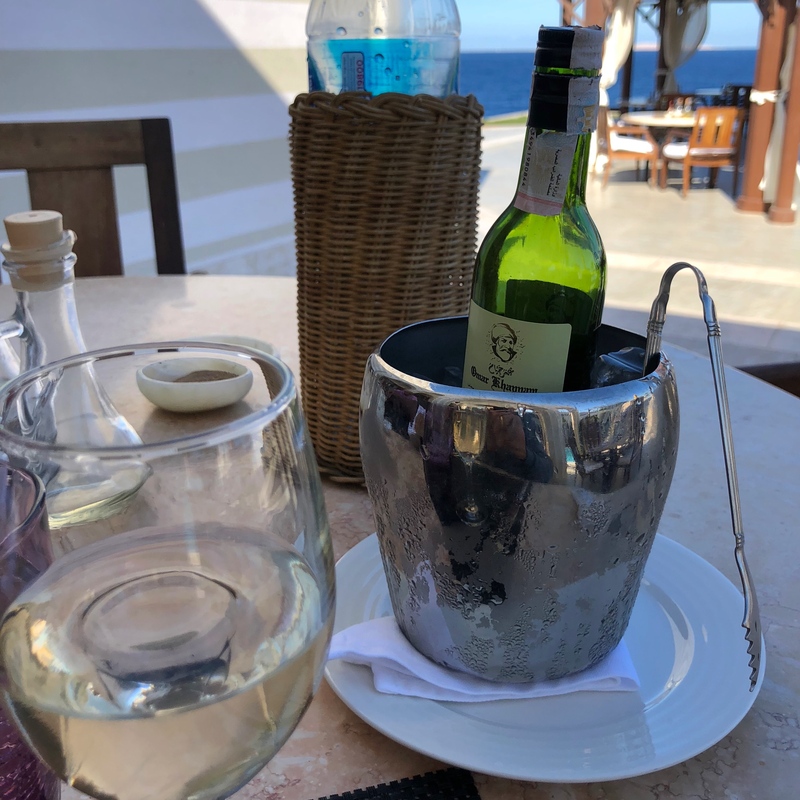 On the last day here I decided to have a glass of wine with my lunch. I was a little surprised when it came in an airplane bottle, complete with a miniature ice bucket. But aside from that impressive reef, even the Oberoi was a disappointment. The landscape was too stark. The hotel was strangely designed so that the well-appointed rooms mysteriously faced away from the sea. The food was hit or miss (more miss). And when we took a long drive into Hurghada for lunch outside the resort, the best restaurant we found was dreadful. And I won’t blame the Oberoi, but we managed to have five days of weather dominated by wind. It was so windy we never wanted to go in the water, which was rough. The exception was the third morning, when the wind was gone and the water was miraculously still, like glass. An English guest told me this was his last day of a two-week stay, and it was the first day without that hideous wind. He also told me how great the snorkeling was, so Jim and I headed to the dive shop to get snorkel equipment for the first time. When we came out of the dive shop 15 minutes later the wind had come back out of nowhere. We couldn’t believe it! The gorgeous morning had given way to that damned wind, just like that! We did snorkel anyway, and it really was impressive, until the wind and waves caused me to stress out and crash onto the reef. So I left Hurghada with my hands and legs covered in scratches, cuts, and bruises. And on top of that, Jim came down with a nasty case of food poisoning. So this stop was not a huge success. Let’s hope we like Sharm El-Sheikh better. Oberoi hotels tend to have beautiful Indian Mughal-style architecture. But here the landscape was dull, and the rooms were strangely oriented away from the beach. One day we took a LONG drive into a touristy area for lunch. 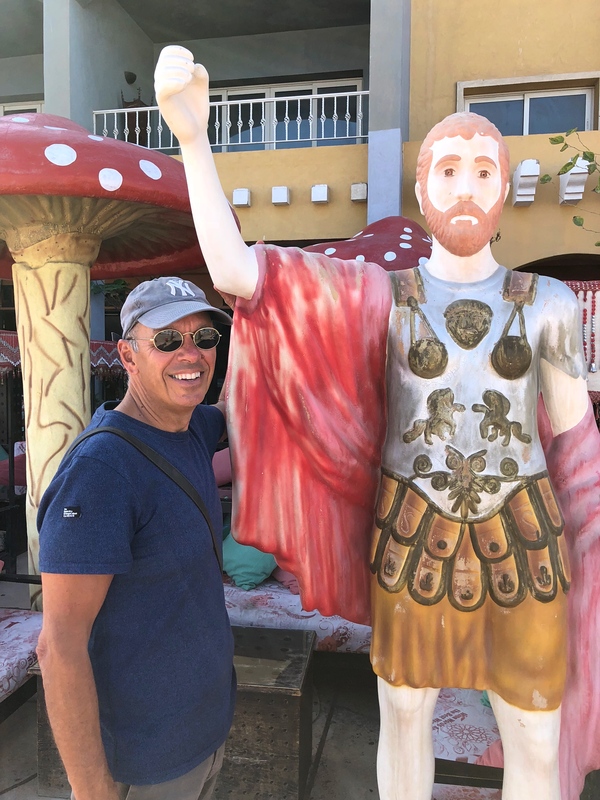 The restaurant choices were dismal, but Jim did get a chance to pose with this Roman soldier. As I mentioned the landscape here was surprisingly stark and dull. The sky was not actually dappled. I added that to punch up a boring picture. The tomb of Tutankhamun in Valley of the Kings. Seeing it spelled like this I recognized that “ankh” is the Egyptian symbol of life while “amun” was the Egyptian sun god. 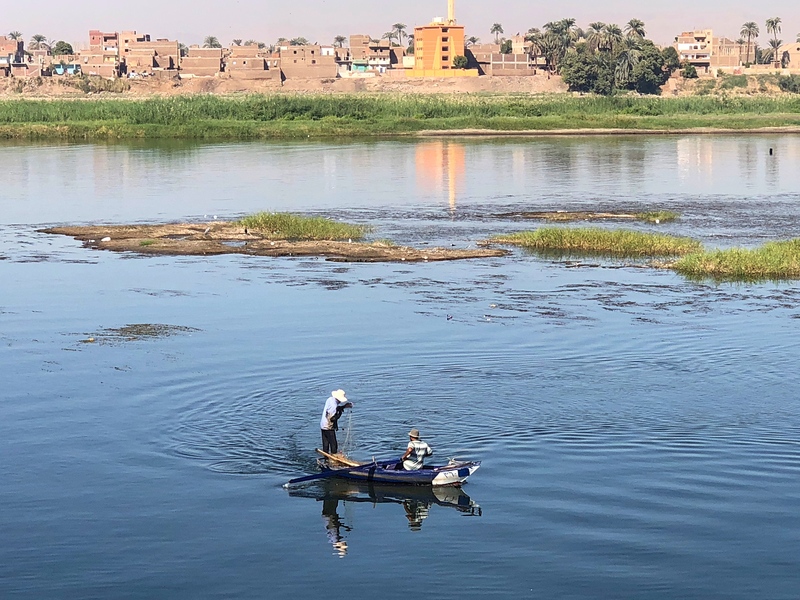 We sailed north from Edfu to Luxor, arguably the most important site of Ancient Egypt. Known to the Greeks as Thebes, the city grew in prominence from about 2000 BC when it was the capital of Upper Egypt (note that I’m finally getting used to the fact that Upper Egypt is in the south, referring to the upper Nile, which flows northward into the Mediterranean) until by 1550 BC it was the political, religious, and military capital of all Ancient Egypt. Its local god, Amun, rose in prominence with the city and he soon became associated with the sun god Ra as the “king of gods,” Amun-Ra. Together with his wife Mut and son Khonsu, the moon god, they ruled as Egypt’s divine trinity. (Wait, a big god father, a mother who is worshipped, and a son also worshipped as a god; I’ve seen that pattern somewhere. 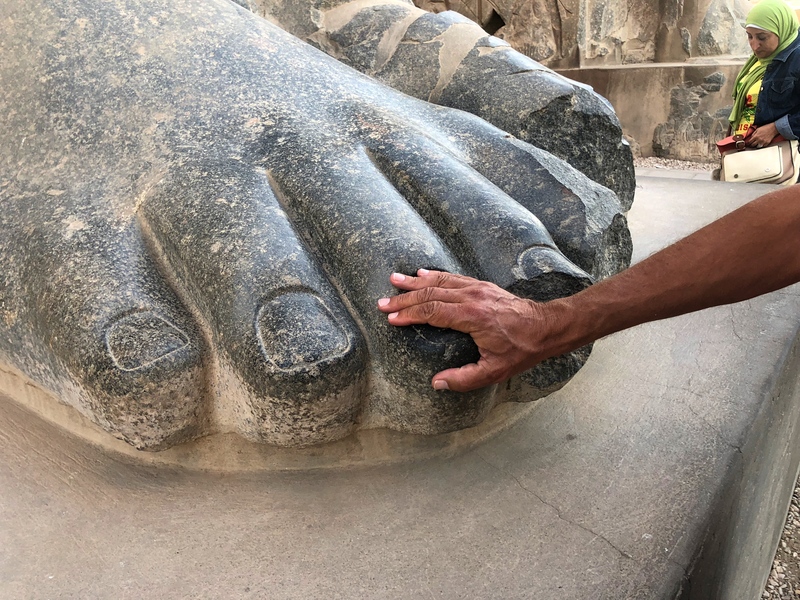 It seems like a good model to copy if someone were creative…) By the time of the conquest of Alexander the Great in 323 BC the city had fallen into ruins but he came to pay respects and essentially claim the mantle as the new Amun-Ra. 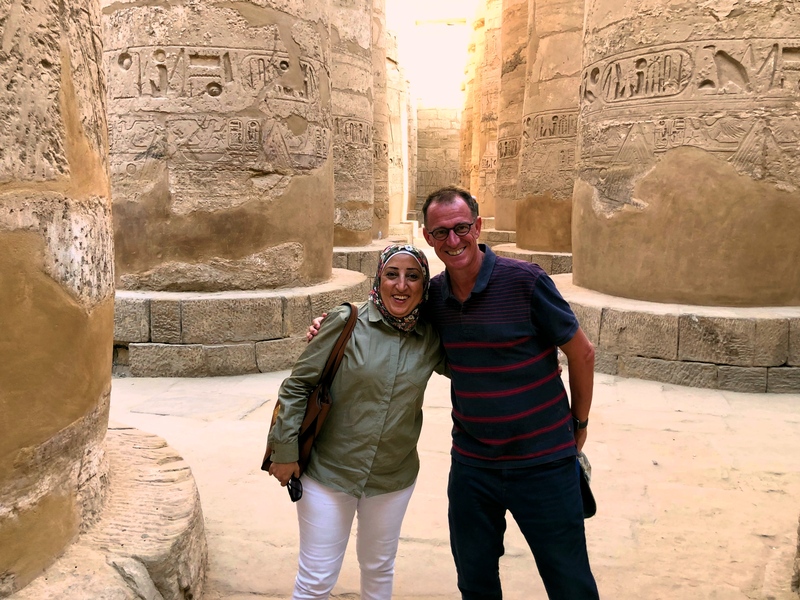 During those thousand-plus years, though, there was a millennium’s worth of wonders built and today Luxor is known sometimes as the world’s greatest open-air museum: temples of Karnak and Luxor, the Valley of the Kings and Valley of the Queens across the Nile. With so much to see we were glad to have three days here to drink it all in. 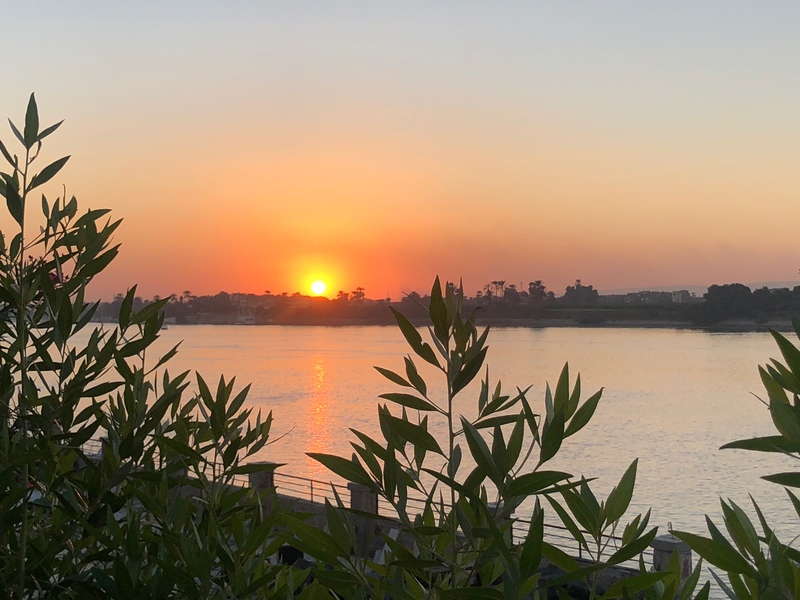 Sunset on the Nile. We’re on the east side of the river, meant for the living, while the west where the sun sets and things go to die is for the Theban Necropolis. It might be worth mentioning that modern history hasn’t been as kind. 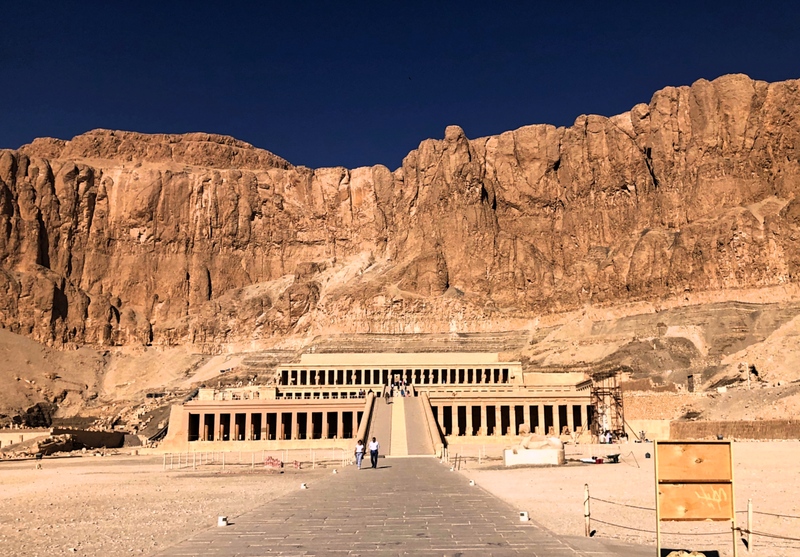 Luxor was the site of major 1997 attack where six Egyptian terrorists killed 62 tourists at the Temple of Hatshepsut, devastating the tourist industry in Egypt broadly and Luxor specifically. The 9/11 attacks just four years later, followed by a terrorist attack at Sharm el-Sheikh in 2005 and the revolution in 2011 that removed long-serving President Hosni Mubarak, didn’t help. Today the area seems remarkably calm; tourism is still reduced but there’s lots of security and – from a purely selfish perspective – it’s a lot more fun to tour the sites without massive hordes. The Mortuary Temple of Hatshepsut, site of a great burial chamber and a terrible terrorist attack. On the other side of that imposing hill is the Valley of the Kings. 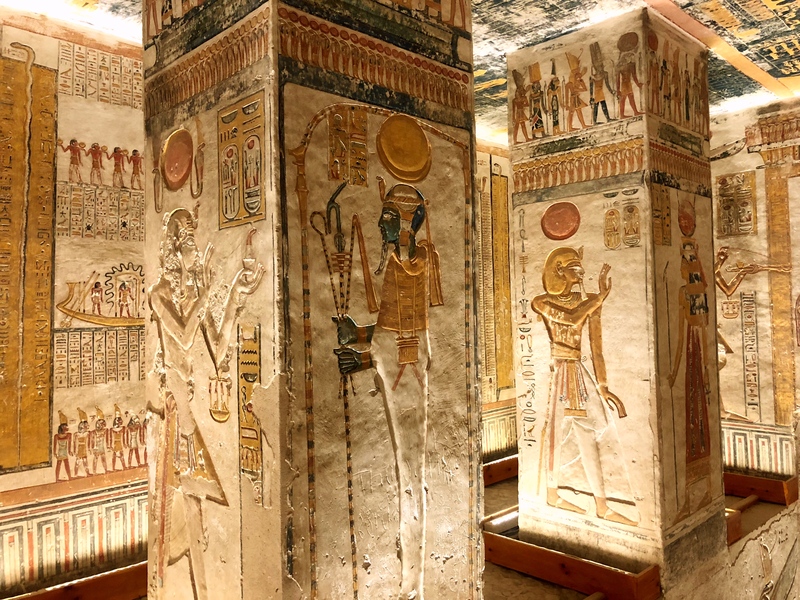 What’s all to see in Luxor now? A lot. 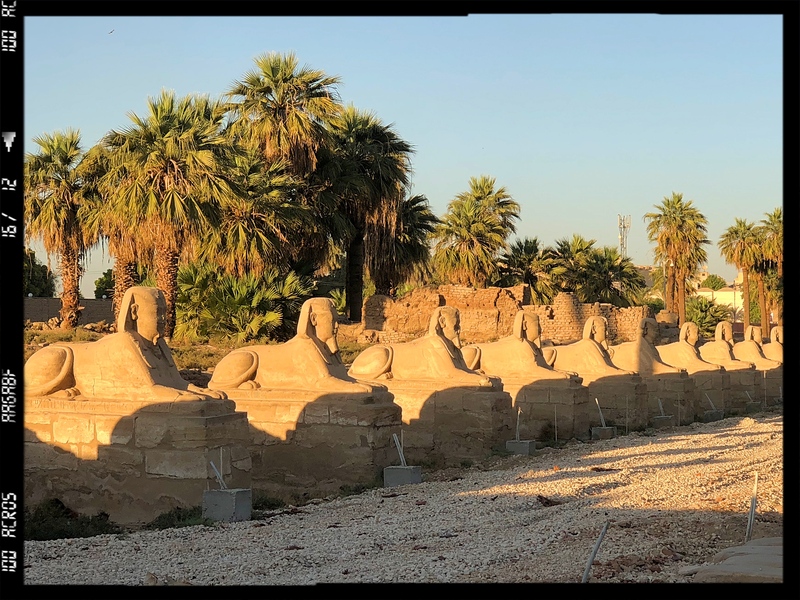 First on our agenda was Karnak, a vast temple complex just a couple miles from the modern city center. How vast? After Angkor Wat in Cambodia Karnak is the second-largest religious temple in the world. And if you’re wondering – I was – in our travels Mark & I have been to seven of the 10 largest. 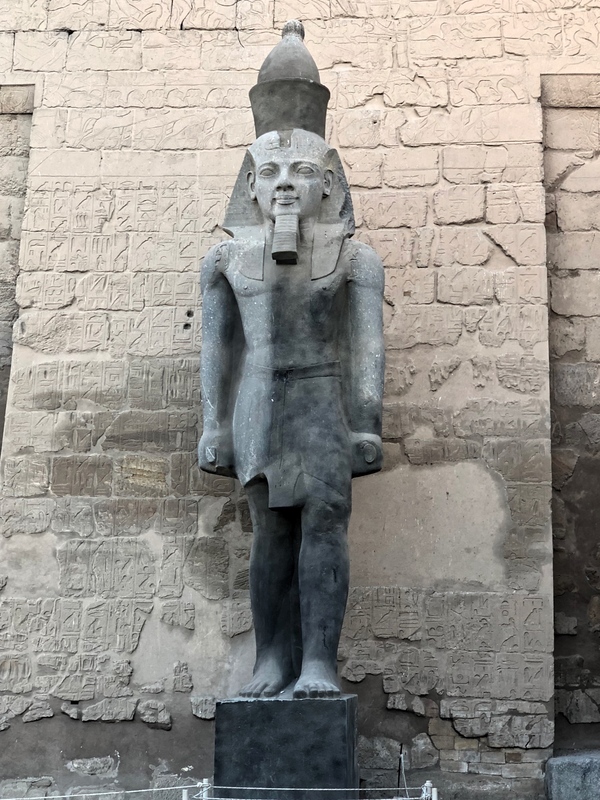 At any rate, construction here began at the start of the second millennium BC and lasted all the way through the Ptolemaic period after Alexander’s conquest. 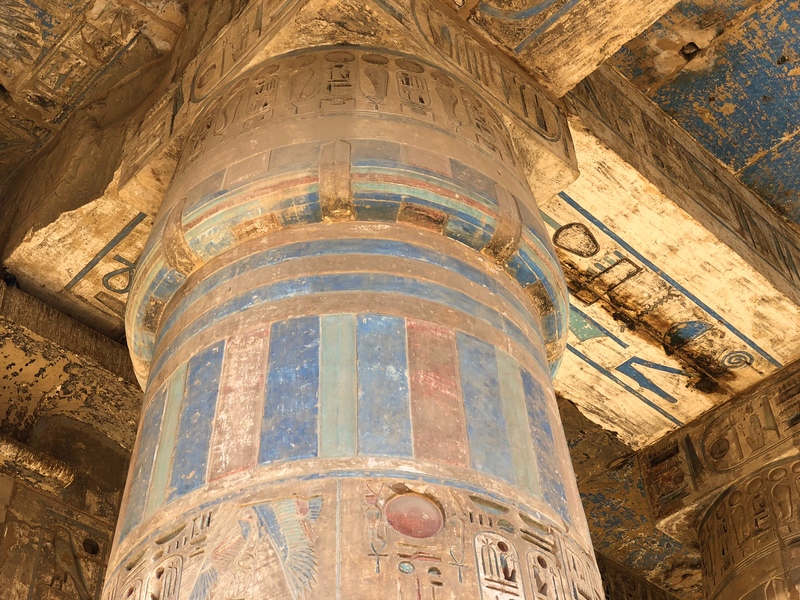 Some 30 pharaohs contributed to the construction giving it diversity and complexity unmatched anywhere. 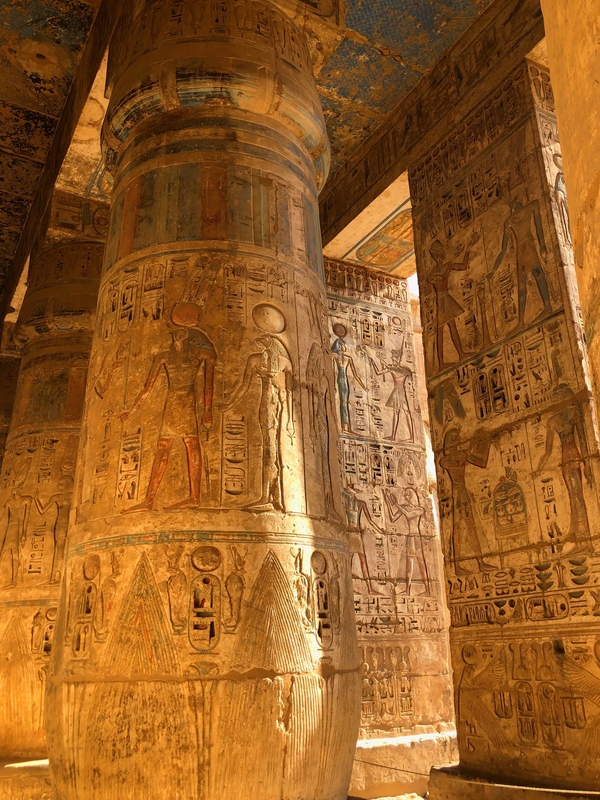 The largest part of the temple is dedicated to Amun-Ra, an area consisting of 134 massive columns, though there are all sorts of areas in the temple worth exploring. 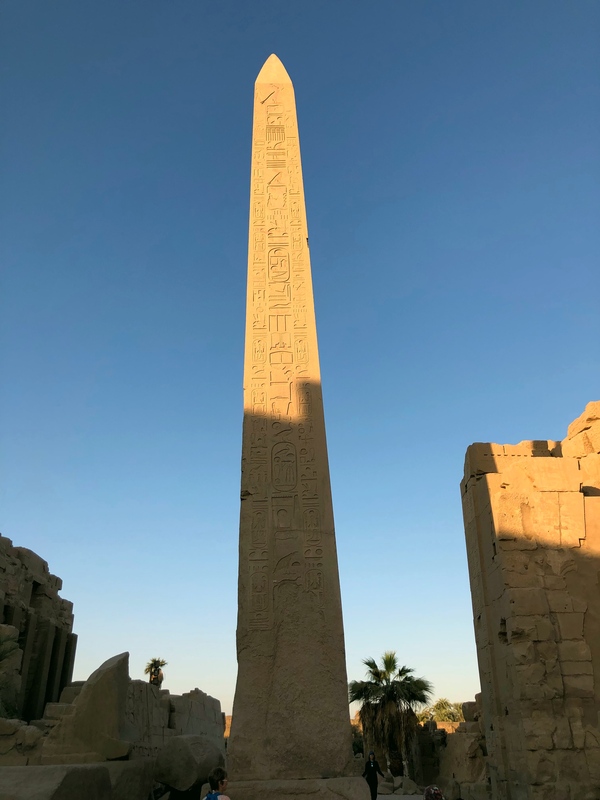 An obelisk or two that have stood tall for some 3,500 years, massive pylons (the Greek term for the monumental entrances to Egyptian temples), lots and lots and lots of stone carvings. Truly an amazing site. From Karnak we made a relatively brief stop at the Luxor Museum. By now it was late in the day and I wasn’t really up for it but when your tour guide tells you to go, you go. And I was really glad I did. 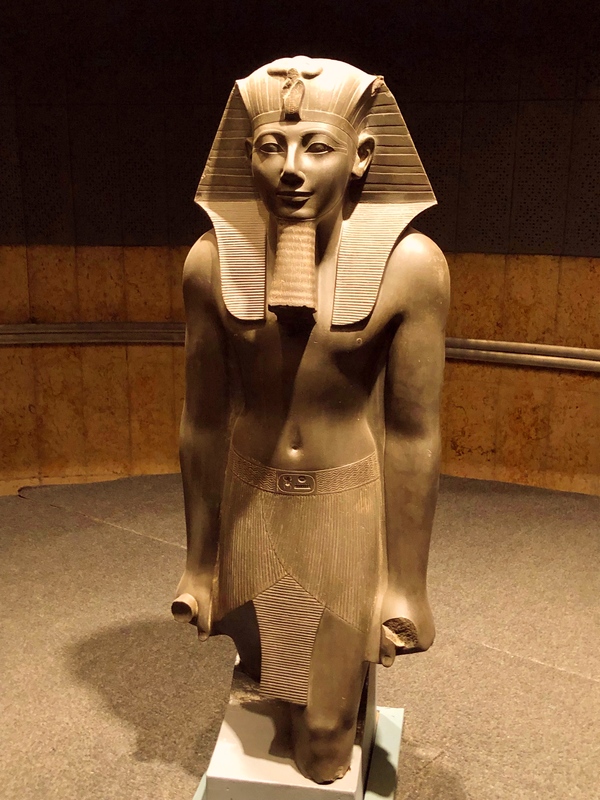 Inaugurated in 1975 it is much, much smaller than the great Egyptian Museum in Cairo but at the same time much easier to digest; the museum prides itself more in the quality of display than the quantity. And the quality is spectacular, including a couple mummified pharaohs and some stunning sculptures. Also in the Luxor Museum was this statue of Akhenaten, husband of Nefertiti and (probably) father of Tutankhamun. Not only did Akhenaten try (unsuccessfully) to get Egypt to abandon her polytheistic roots in honor of his preferred god Aten but he even tried to change the art style as this almost El Greco-esque piece displays. Then there was Luxor Temple itself. 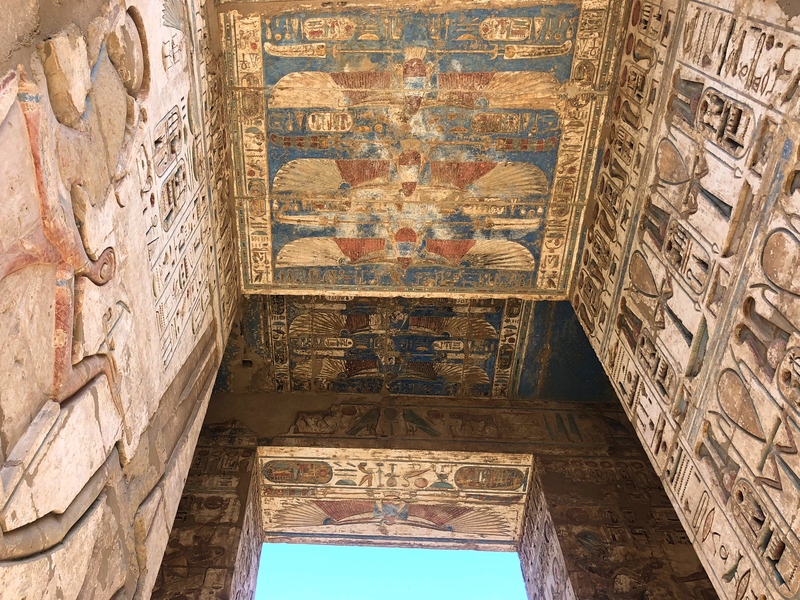 Built about 1400 BC, it seems to be a temple dedicated to kingship itself and may have been where Egyptian pharaohs were crowned. The entrance to Luxor Temple is a bit unbalanced; the single obelisk on one side needed another to balance it off. Well indeed there was once another obelisk there and it turns out I’ve seen it many, many times: it’s the obelisk that now stands in the Place de la Concorde in Paris! And I was intrigued with a temple within the complex that was supposedly built under the orders of Alexander the Great in honor of … himself. Then it was across the river to the various necropolises that were built on the west bank (the sun sets in the west, so that side is all about dying apparently). 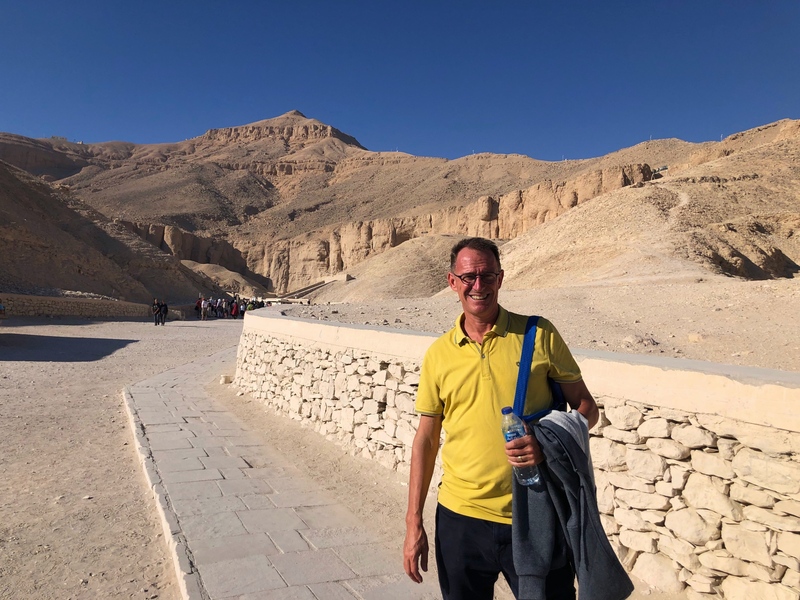 The Valley of the Kings is the star where from the 16th century BC until the 11th pharaohs had tombs cut into the rocks and were buried in lavish style. 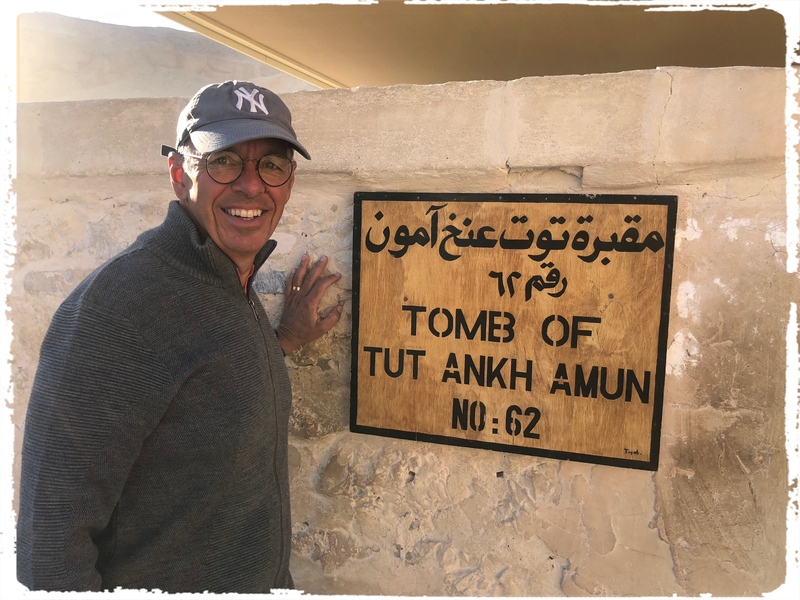 While many of the tombs were robbed and ransacked the tomb of a distinctly minor king who died at the age of just 19, Tutankhamun, was found nearly intact in 1922. Our last major site was the Mortuary Temple of Mortuary Temple of Hatshepsut, dating to the 15th century BC. Hatshepsut was an interesting figure. She was, you see, a she, not very common among ancient royals. I mean, some 3,500 years later the U.S. still has issues with elevating women to high office, but I digress. 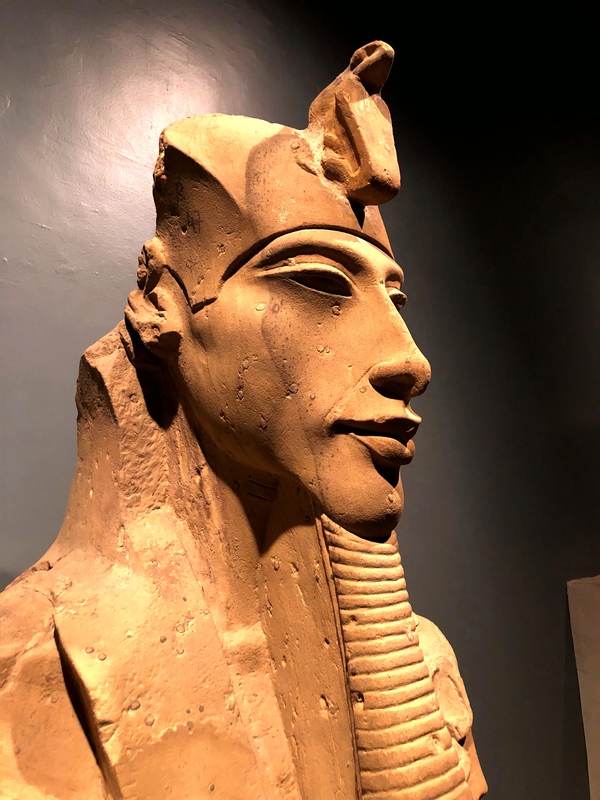 But Hatshepsut reigned for at least 21 years and perhaps as long as 50 years, donning a fake beard and dressing as a man, but definitely a woman. She ascended to the throne after her husband died and left only a two-year-old son to succeed him. 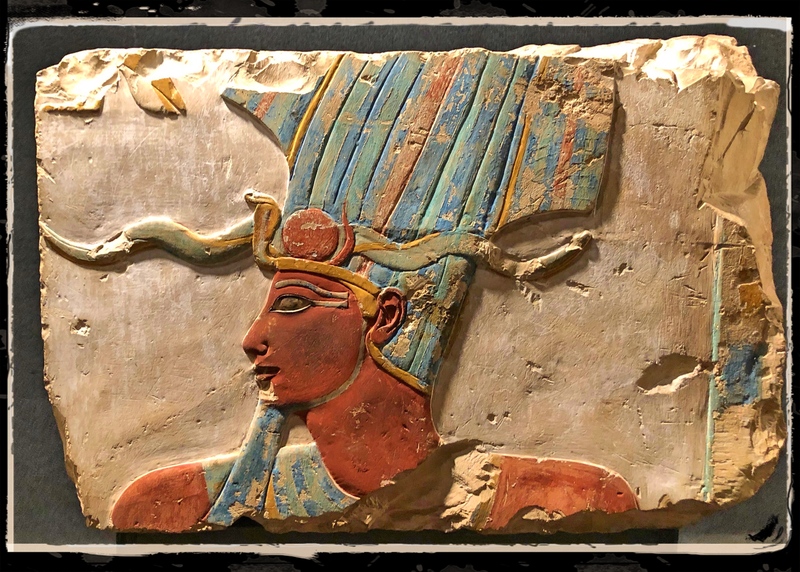 Hatshepsut ruled in his place and, as he grew older, came to kind of resent his mother. On her death he succeeded on his own and had all her names erased from the temple. Still, she is regarded as one of the great Egyptian pharaohs though not necessarily as the nicest mom in the world. She opened major trade routes for Egypt and is considered one of the greatest of Egyptian builders. 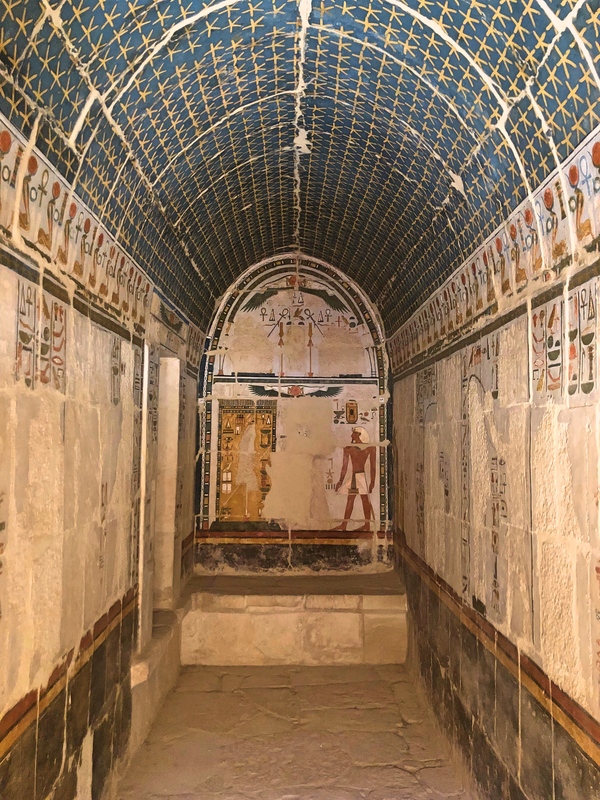 One of the side rooms in the Mortuary Temple of Hatshepsut. The room itself is gated off and weird thing here is that it was entirely unlit; with the naked eye you could see nothing. If you put your iPhone up to the gate though it could adjust and see inside just fine. Wow, just wow. After all that, I have to admit that I’ll be glad to spend a few days not touring old temples. And it’s worth adding that if I had it to do over again, we wouldn’t have done this on a cruise. We’re not cruise people, you see, and don’t usually like organized tours of any sort. I had this romantic notion of cruising down the Nila ala Cleopatra and Julius Caesar, but in practice there was more anchoring in a couple towns than actual cruising. 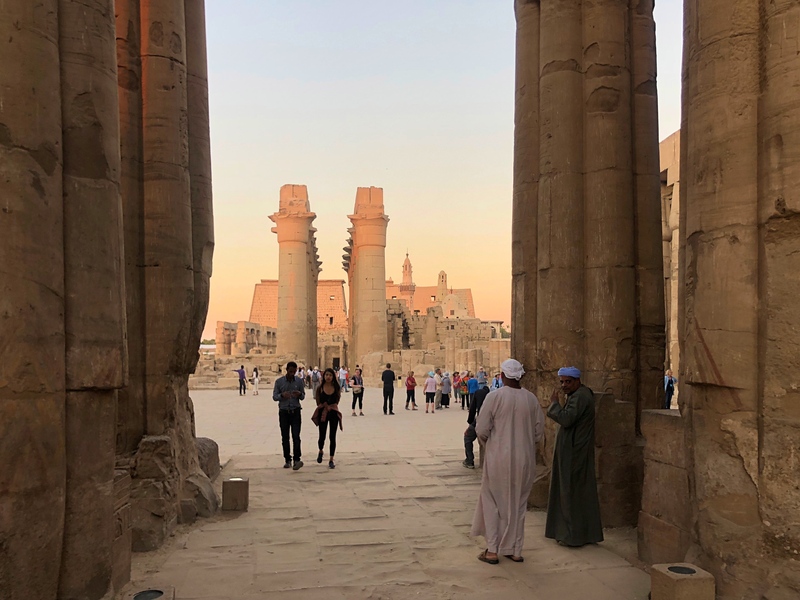 We’d have been better off staying in hotels where we could experience the contemporary scene along with the great ruins and then maybe taking a day cruise or two to experience floating on the Nile. But – and this is a big but – I learned a tremendous amount from our guide. 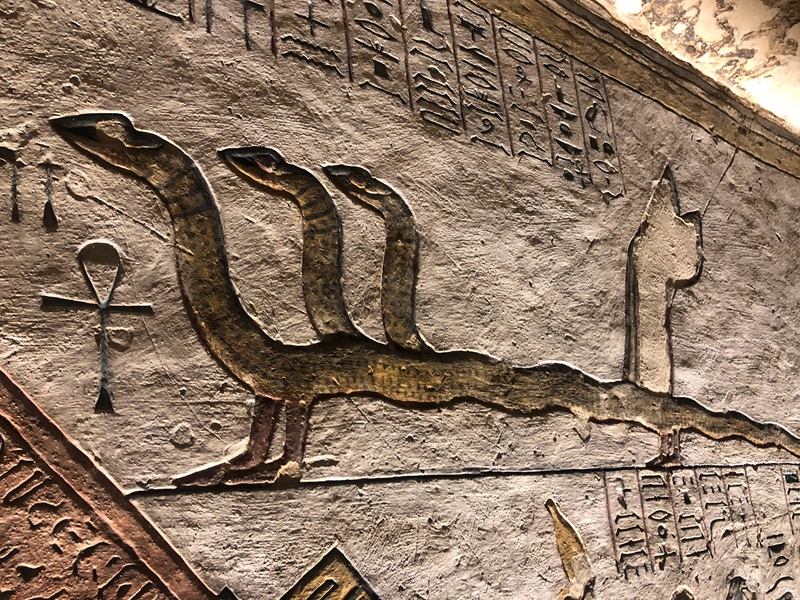 Until now Ancient Egypt has always been a big, vague empty spot in my understanding of ancient history but this was about as good an introduction as you can get. Good enough that I’m now reading a history of Ancient Egypt that I just never would have been able to understand before. So in that sense, mission accomplished. 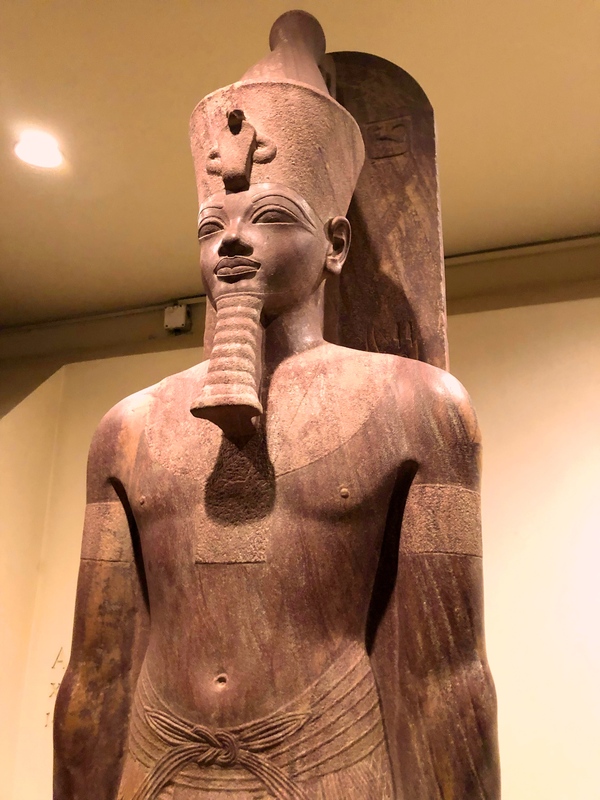 Amenhotep III from the Luxor Museum. The quality of the stuff here was amazing. 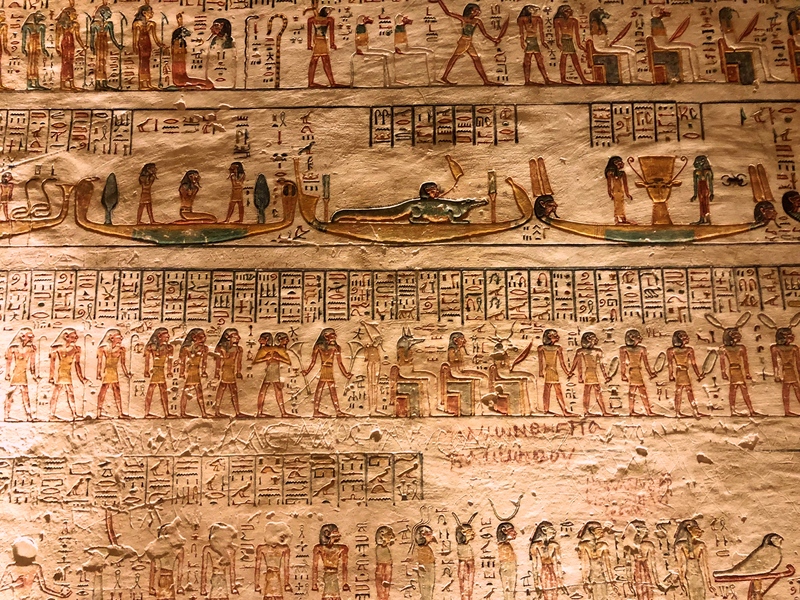 Some of the hieroglyphics in one of the tombs. 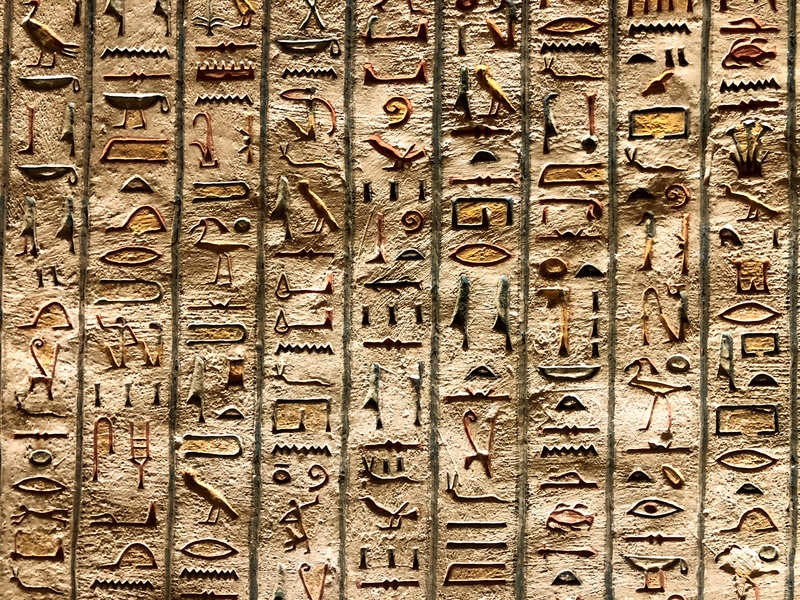 I learned a lot during our week on the Nile but I still can’t read this (yet). 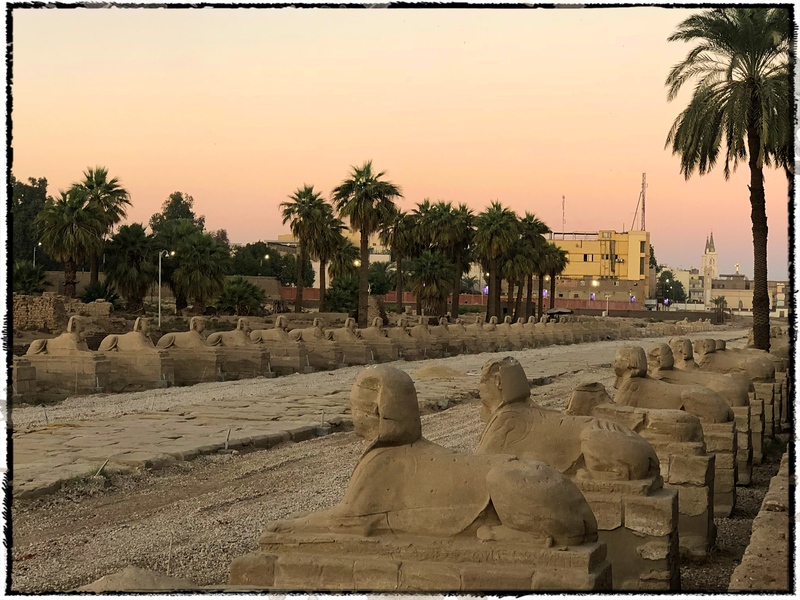 The Avenue of the Sphinx in Luxor has only recently been excavated. Connecting Karnak with the Luxor Temple it was a major thoroughfare for religious festivals during Luxor’s heyday. 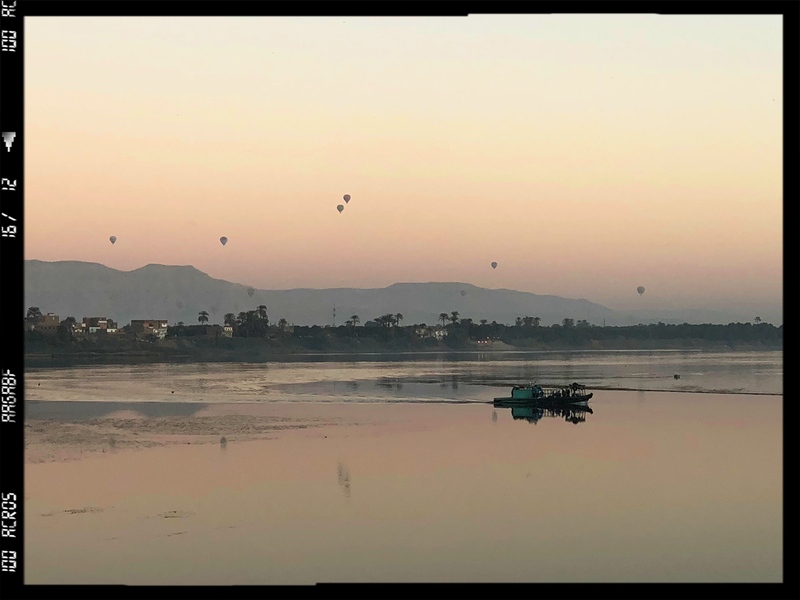 Hot air balloons in the early morning sky above Luxor. Fortunately none of these exploded. And life for us on the Nile. We upgrade to get a nice outdoor space … so we can hang our laundry out. The neighbors likely think the Clampetts just moved in.